Online Coupon: Click HERE to download the online coupon. 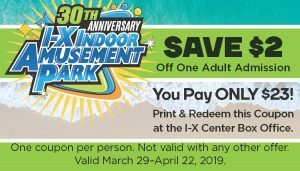 Print and redeem this coupon at the I-X Center Box Office. Military Discount: With valid Military ID you can purchase up to four general admission tickets for $15 each. Tickets are available at the Show Office. 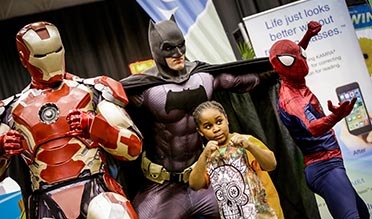 Join us for our Military and First Responders Day on Sunday, April 7th and receive FREE admission for all members of active military, fire, police, and safety personnel. Click HERE for more information. Valkpak: Click HERE to enter your promo code from Valpak. 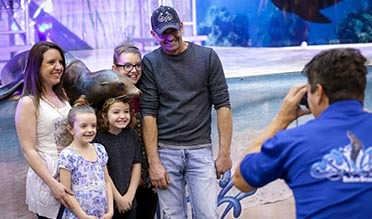 Be amazed, laugh and learn during one of our daily shows happening every half hour! Click here for info. Be sure to check out our hours before arriving at the park, dates and times may vary. Click here for more info. 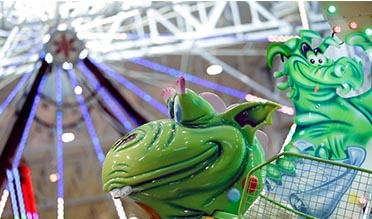 Questions about the Annual I-X Indoor Amusement Park? We'll help get them answered. Click here for info.